Your own private paradise on the tiny, island hideaway of Antipaxos! Utterly charming in every way… that is how one of our Villa Specialists described Iremia after her first visit! Intoxicating views take in the nearby vineyards, the turquoise sea and a large expanse of this dreamy island’s coastline. Enveloped in total peace and quiet and boasting a lovely pool, Iremia is a unique, simple villa built with and inspiring love! Inside: the main entrance of Iremia leads into a large open-plan sitting, dining and kitchen area, furnished with comfortable leather sofa and armchairs and a large farmhouse table. The combination of lofty wood-beamed ceilings and panoramic French windows make for a luminous environment. The two bedrooms, a double with en-suite shower room and views of the gardens and countryside, and a double-twin with adjacent shower room, are accessed from this living space and the overall effect is one of a simple, beautifully crafted - the owner built it himself over many years - and extremely homely villa. Outside: arrival at Iremia is an experience to remember. As you walk in through the gate, past an organic vegetable garden, one is greeted by the most idyllic views: first of the surrounding vineyards and then of the enchanting coastline and sea of this little island paradise. Outside the living and dining area, and accessed by large French windows, is a shaded terrace fitted out for lounging and relaxation. This also boasts a superb panorama that takes in the sea, the Greek mainland and the cliffs of southwest Corfu. A few steps lead down to the curvaceous pool and a covered outdoor kitchen and dining area. It is here, thanks to the presence of a barbecue and a wood-fired oven, where you will probably end up cooking and dining most of the time. Iremia is totally private, totally romantic and totally peaceful, especially in the evenings when you only have the stars and the moon for company… the perfect place for really getting away from it all. There are no proper roads and no shops on Antipaxos. You will find the house stocked with food and wine on your arrival (service included in the rental price, foodstuffs not included) and then you can either go shopping yourself in Paxos or request the shopping service at a small charge. There are a couple of tavernas on the beaches (open from June to September), but they do not usually open in the evening. Iremia features a fantastic infinity pool, offering swimmers stunning views while in the pool. There is a drop from the infinity edge so we recommend children are supervised at all times. Please refer to our general safety page if you would like more information about infinity pools. For guests arriving in Corfu on a morning flight, a taxi transfer from Corfu Airport to Corfu New Port, the hydrofoil crossing from Corfu New Port to Gaios on Paxos and a boat transfer from Gaios to Antipaxos are included in the rental fee for clients staying at Iremia. For the latter part of the journey the owner Yiannis will pick you up and drop you off with his speedboat. If your flight arrives in Corfu in the afternoon/evening after the last hydrofoil has left, a taxi from Corfu Airport to Corfu New Port is included, but a private sea taxi is not (however, we would be happy to organise for you). In this case, the return leg from Gaios harbour on Paxos to Corfu Airport for your flight home is of course still included. Should you wish to discover the beaches and coast of Antipaxos by boat (which we would thoroughly recommend! ), the owner of Iremia also owns a local boat company and would be happy to rent a boat to you that could be moored on Antipaxos. Please contact us for information and prices. Iremia is situated on the tiny 4km-long island of Antipaxos, which is an oasis of serenity and peace and totally unspoilt. There are no shops (those staying at Iremia can order deliveries of supplies), no real roads, only a couple of tavernas and just a scattering of houses. Antipaxos is all about peace and quiet and glorious beaches. There is a small beach around 500m from the house, while the glorious beaches of Vrika and Voutoumi are just a few minutes' drive/boat ride away. The latter has a couple of tavernas serving lunch on the beach (from June to September), catering also for the day trippers who come in from nearby Paxos (you can go in the opposite direction if you fancy exploring another island). Once the last boat has left in the late afternoon, total tranquillity falls on the island, the sun sets and the stars and moon shine brightly in the night skies. Find out more about travel to/from Antipaxos and about getting around while you're there. Nearest sea access: there is a shady footpath that leads down to a small pebbly beach about ten minutes' walk. "This has been a truly wonderful holiday. There is something quite intoxicating about the gentle sounds of Iremia. Many a relaxing hour was spent just gazing at the view. You felt you had the entire place to yourself. It was all just magical." There is something quite intoxicating about the gentle sounds of Iremia. Many a relaxing hour was spent just gazing at the view as boats, both grand and not so grand, drifted past. Then at dusk, the sea cleared and you felt you had the entire place to yourself. It was all just magical. To have had use of the boat and jeep made the island experience so enjoyable. We also managed some walking in the cool of the day – to the lighthouse and also along the ridge towards Vrika. Again, we saw only one or two people so the impression was of experiencing the whole island to oneself. This has been a truly wonderful holiday. Antipaxos will not always be this natural – we have been privileged to experience its magic. Thank you to the owner and his family for all their kindness and hospitality and for making it all possible. Iremia was just what we were looking for: beautiful location, peace and quiet. The owner was very welcoming and helpful. We spent a fantastic week at Iremia. 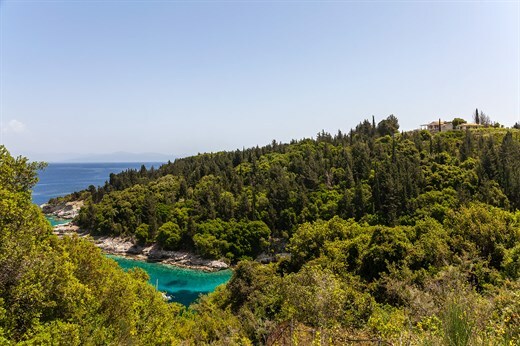 The owner has built a villa on the beautiful coast of peaceful Anti Paxos island with love and charm. Within few hours we were fully relaxed and recovered from our busy daily life. Our experience at Iremia will remain forever in our hearts. The perfect relaxing holiday - thank you. Iremia is beautiful and the owner is a delightful man. Nothing was too much trouble. Staying at Iremia had been in my bucket list for a while. The reality exceeded the dream. The grounds - beautiful - best view of any holiday property we've stayed in. The island, fabulous. Yiannis, the owner - warm, kind, funny, generous. he made our time there even more special. Having our own boat... the beaches. THAT sea - the internet images have not been manipulated; it really IS that beautiful. .. Our holiday was extraordinary. It was without a doubt one of the best we've had - blew the Seychelles out of the water. I was tearful having to leave - that's a first. We found Iremia to be incredibly charming and immediately fell in love. The view from the terrace was spectacular - we never tired of just gazing out to sea for hours. Loved the tile floors throughout, and the big dining area inside. The owner told us it was his dream house, and we could see why! Our week at Iremia was a Mediterranean dream - waking at dawn to gorgeous views not just of the sea but the vineyards and olive groves covering the island. I loved grabbing some veggies from the garden grilling up some pork chops. The island was so quiet and peaceful, it really seemed as though we had travelled back in time to ancient Greek times. We had a lovely time. The owner was very friendly & helpful. All perfect. The owner was a complete star! What we most enjoyed about the Ionian Islands? The solitude, Greek hospitality and the best villa - Iremia - we have ever visited. We thoroughly enjoyed our holiday at Iremia. This villa is breathtaking in its seclusion. We were truly able to unplug and get away from it all. It's definitely a high end service you offer, which comes at a premium. The experience we had with The Thinking Traveller was second to none. The service and attention to detail was outstanding. We had such a wonderful stay at Iremia. We couldn't have enjoyed our holiday more than we did, it was absolutely perfect. Some aspects of the villa were quirky, but given the amazing position on such a remote island they were fully forgiven! Everything else was excellent and the views from the patio/pool area were incredible. Rebuilding the villa was clearly a labour of love by the owner, Yanni - and it shows. The villa was absolutely beautiful. The interior of the villa was superb; it was fully functional, tastefully decorated and very comfortable. The views over the bay were incredible. Our holiday? The villa, the boat, the beaches, the views... It was all unbeatable. A truly wonderful family holiday. The grounds surrounding the house are very rustic... we loved it. We absolutely loved this holiday and were surprised by the easy accessibility of Corfu and the unspoilt nature of Antipaxos... The food delivery was great but it was even more wonderful to be able to use the produce from Iremia's garden... This was exactly what we needed, a holiday with privacy, good food, in a beautiful environment. Thank you to the property owner for opening up the path to the cove. Magical! The two beaches were amazing. We felt like we were in the Bahamas. The tavernas were also great.